AT least two kings of Spain have eaten at Javier and Luis’s seminal restaurant Tito Luigi in the heart of Pradollano. 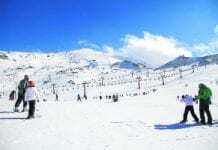 Take a look on the walls and you’ll find evidence of the Spanish royal family’s many sojourns down to the golden slopes of the Sierra Nevada… and plenty more aside. Indeed, over the last three decades, this wonderful restaurant has provided tucker for bullfighters, Hollywood stars and politicians. And it’s perhaps not surprise for a joint that consistently provides for 250 covers at night during the busy season… and it won’t cost you an arm and a leg. Specialising in good Italian fare, it serves up great pizzas, pasta dishes and my favourite squid-ink spaghetti with prawns. The pair have another, hipper restaurant Tito Tapas just up the road and a third more formal restaurant up the hill in the middle of the resort. One thing for sure, since I first came to review the restaurant scene of the Sierra Nevada a decade ago, things have changed substantially. While this may not be San Sebastian, the sheer variety of restaurants in Pradollano is as good as anywhere in Andalucia… and the quality keeps getting better. Much of this is thanks to a strong influx of foodie restaurateurs in recent years, with the latest including an excellent Japanese, Shimbuya, the buzzy Mar Sala and the excellent Braseria. “You really need to have your specific niche and I really like to do things differently,” Yolanda, from Braseria told me. This certainly rung true when she brought out a delicious starter of thinly sliced foie gras with mango and strawberries and a rocket salad, followed by a churrasco de ternera served with a ripe melon and brown sugar! 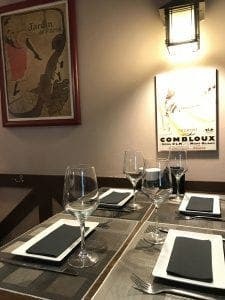 The trendy joint is the second place she and partner Jaime have opened after working for seven years at the nearby La Fondue de Noa restaurant, which is a more traditional place, but really popular with punters on the slopes. With its classic Alpine look, it is hard to miss, but be warned, there are a few modern twists on the food including the half dozen different ways to have a fondue. One is a Mexican-style called ‘Chingona’ and another is called ‘Curry House’ which is obviously a hit with the Brits. But, without a doubt, still leading the way in the creativity stakes is Stevie Silva and his hip young team at Ci Vediamo. I met him and his charming girlfriend Luna Coronado, who runs the restaurant, exactly a decade ago, and their success could not be more deserved. Opening just as the worst recession in Spain’s history kicked in, they did anything but contemplate their navels and came out fighting with new dishes by the week and a new look every season. Former professional snowboarder Silva loves to experiment in the kitchen (much of this after his regular trips abroad in the autumn to places like Indonesia, Mexico and Brazil) and he changes his menu by the day depending on what he can find in the markets. 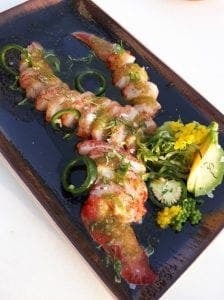 And after the success of various Asiatic dishes – such as uzukuri of turbot with yuzu and kimchi and an amazing soft crab tempura – it was perhaps no surprise that he would attempt to branch out further. 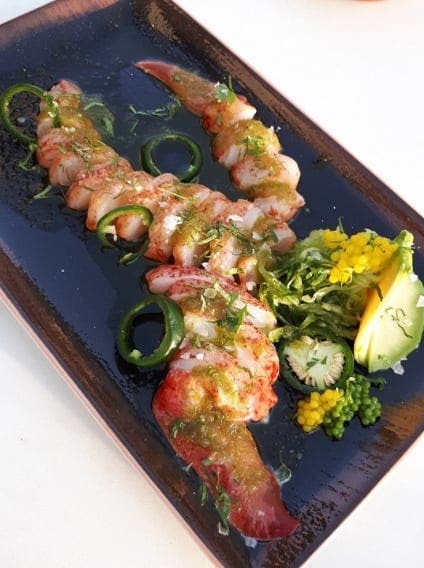 And the result of this is the fabulous new restaurant Shimbuya, an Asiatic-fusion joint, which he and Luna have created in one of the coolest spots, halfway up the resort. Staying faithful to the Japanese style of minimalism, it has electric blue tiles on the wall and lots of plain wood and even a slot machine at the door. This is a must-visit on a trip to the Sierra Nevada to try out its great sushi, made by Stevie and his team, in particular Inaki, from Pamplona, on the spot. The version of a California Roll I tried was simply amazing with a king prawn, salmon and sesame seeds. While up here, you must also consider trying the excellent Swell next door. This is one of the coolest places to eat, where many of the locals go and with a great mix of dishes, such as salads and woks. I had some superb gyozas and a great burger, which ticked the box, particularly as I watched a Champions League game on the big screen on one side. 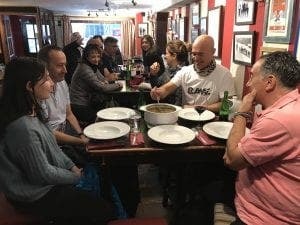 Another great new place to try out is La Cariguela, which is the sister restaurant (but the complete opposite) of the resort’s most popular tapas joint Bar Ski, set up by Nichi nearly two decades ago. Here you will find Nichi’s partner Fatima running a classic soul kitchen concentrating on excellent quality fish and the resort’s only Moroccan dishes, including a delicious chicken tagine. This is a classic local place, warm and friendly, where service is at a premium and where you will eat some of the resort’s best food, including my personal favourite the tartare of bluefin tuna with avocado, apple, cucumber and caviar. In particular, stop to chat to Fatima’s son Mohamed, who is a livewire of information and at 21 as ambitious as anyone I’ve met in the Sierra Nevada. Back down in the main part of Pradollano there are plenty of other good places to look out for. These include La Muralla, run by Argentinian Gonzalo Funes, and appropriately with the best steaks in the resort, not to mention excellent wines by the glass. The ‘tostas’ are also great and come in various guises, while I loved the milhoja of foie gras. He and his brother Luciano also run the brand new Muralla Burguer, almost next door, which specialises in the best quality burgers on the slopes. It’s a lovely spot and makes a great addition to what is easily the most competitive run of restaurants in the Sierra Nevada. 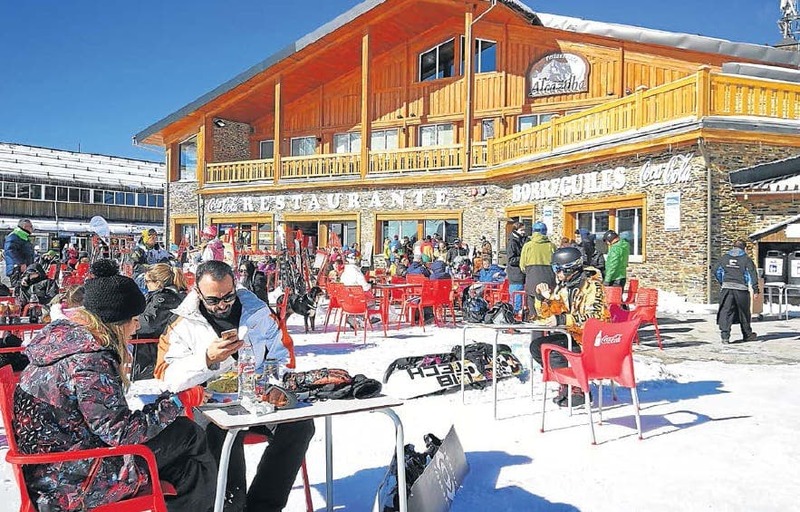 And don’t forget the brothers’ other bustling spot Las Gondalas, right in the heart of the town and perfect for some apres ski light bites, a hot drink or a beer. The cool sounds playing to the terrace attract a cool crowd and you will struggle to find a seat on many days. 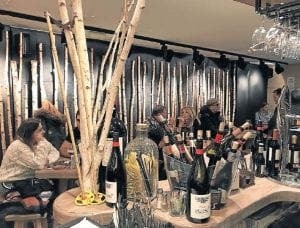 Just up from here, look out for the amazing Bodega Casablanca run by Jose Carlos Villanueva, who grew up on the slopes, with his father opening one of the first hostals in the 1960s. The historic photos add to the atmosphere (as does a framed Olive Press article!) and the heart-warming soul food is always excellent, and includes stews, lentils as well as prawns wrapped in potato with a soya mayonnaise and lovely lamb chops with whisker-thin wild asparagus. Newer and really leading the charge food-wise is La Mar Sala, where Carlos has created an ambient spot, perfect for tapas and wines by the glass. 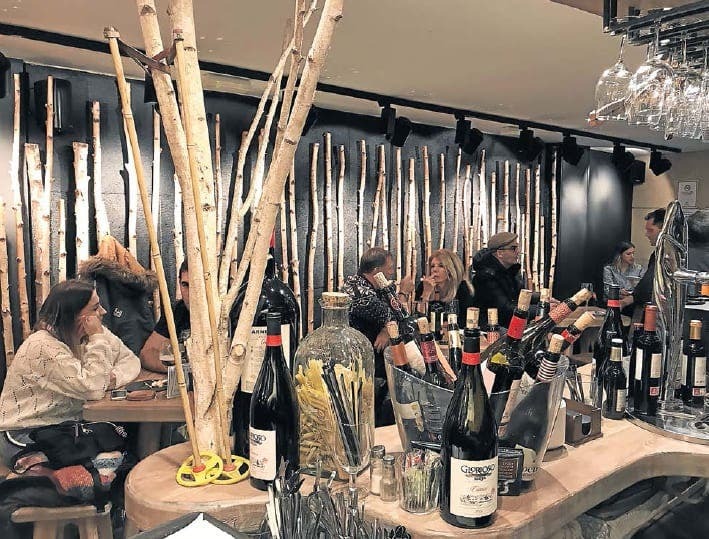 This prime spot by the Melia hotel is normally filled to the rafters and counts on some excellent wines by the glass and the very best seafood from Motril, including boquerones, cigalas and conchas finas. A genuine find. He has also just opened another place called La Mar del Bueno, which is a very stylish place and promises to be a true winner this winter, with a decent, creative looking menu. Another excellent place overlooking the slopes is Tia Maria, which has a good mix of dishes and is a great place for breakfast. Run by Carlos, the brother of Tito Luigi’s Javier, this is an institution and place to while away the day. Next door, you will find perhaps the most scenic place to take lunch in Spain. Recently opened, Al Dente has a superb mix of Italian and Spanish dishes. My tomato, mozzarella bruschetta with basil and black olives was original, while I particularly loved the Saltimbocca, which is fillet steak stuffed with ham and with a rich ricotta sauce. There were some delicious ‘niscalo’ mushrooms added for extra measure. Recently opened by a friendly Granada lawyer Antonio, his team are knowledgeable and service is crisp. 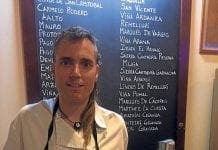 He also co-owns the well established La Visera next door, along with chef Pepe, who is a very capable chef and always leading the charge in the kitchen. For coffee, breakfast, and in fact just about everything, Vertical is hard to be beaten and also has a great range of snacks and light bites, including hot dogs for the British clientele. Another brilliant option, particularly for great coffee and amazing pastries, is La Croissanteria, in the heart of the main square. Run by friendly Argentinians Cristian y Jessica, service is very much with a smile and there are even a couple of unusual south American chestnuts I had never tried before.